"Zane, did you poop?" I ask him. "No, I peeped," he replied. I snickered. I've always been a sucker for all sorts of word play. Except for bad puns--I don't think that anyone likes bad puns. Except for my dad, maybe. But he's a dad, so I think that's an occupational hazard. On another topic, lots of Blog Hops happen over the weekend, and here are a few. These are great ways to meet new people, as well as increase your followers. If you're interested, click on the buttons! KLOL.. my daughter does the same thing now when she goes into the bathroom. I have to close the door and wait outside. I find myself asking her the same questions and wondering what the heck she is doing. Believe me, little girls are just mischievous as little boys when they are in the bathroom. Love it. I really enjoyed your post. I am following your from the blog hop. Feel free to follow back. Dishes, Diapers, Degrees Oh My! 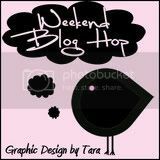 Found you through weekend blog hop, and I am following hope you can follow back.